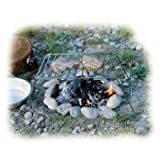 Small, folding grill that can be pu to the fire with no sense of guilt! No sharp edges or corners and large enough for 2 large steaks or several sausages. Well made and chromed. Grill surface 29 x 21.5 cm. Approx. 16 cm high when erected. 400 g.